Martin Freeman as Watson and Benedict Cumberbatch as Sherlock. As we all know, since 2010 two shows (CBS’ Elementary, and the BBC’s Sherlock, which has also been picked up by PBS Masterpiece) have reimagined Sir Arthur Conan Doyle’s famous detective Sherlock Holmes within a modern setting. As a writer trying to modernize a Victorian piece myself, I have been wondering why, exactly, one of these modernizations has set the world on fire… while the other is just on? It all starts with the fact that the BBC’s version came first. In 2012, when CBS (as has been reported here and here) approached creators Steven Moffat and Mark Gatiss about remaking Sherlock in America, Moffat & Gatiss politely declined. Smartly, CBS chose not to embroil themselves in a legal battle by ripping off Sherlock whole-hog… and instead did everything they could to make their take on a “modern Sherlock Holmes” really, really different from Sherlock. So change, they did. But… at what expense? If you’ve ever watched Elementary for more than five minutes, well, you know… it isn’t ground breaking. It’s a pretty standard network cop show, with a huge budget and all the pretty pretty things. (A Sherlock Holmes purist might say they ruined it. Which I am not. A purist, that is.) But, how? How did this happen? Well, apologies to my lawyer friends (sorry guys! )… but my money’s on the lawyers. The writers probably wrote a hundred drafts, and each time CBS’ lawyers said “no”, for fear of being sued (which was justified, as they were, you know, running with an idea that wasn’t theirs to begin with). Still, even with a possible lawsuit looming, methinks they could have done more to capture the heart of the original Sherlock Holmes stories. Elementary is set in New York City. Hmm. Concerning. Because Sherlock Holmes’s address is 221B Baker Street. It just is. There isn’t even a Baker Street in New York City. By making Holmes an ex-pat living in New York, Elementary has completely ruined this lovely, all-important layer. One could argue (and I do!) that if they wanted to set it in New York, make Holmes a New Yorker! That way, the larger point could be conveyed that even when Sherlock Holmes is at home, he doesn’t quite fit in. In CBS’ Elementary, Dr. Watson is a woman. Now, trust me, I love to see great women characters on TV. 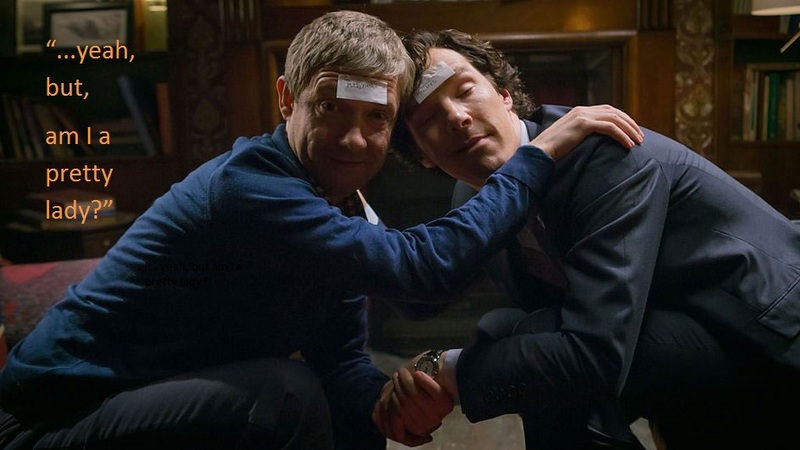 But… the beauty of the Holmes/Watson relationship is that they are both men. I’m sorry, it just is. Blame it on societal conventions, or Sunday Night Football, or the whole of Christianity if you want. Fact is, we live in a world where dudes aren’t supposed to be so fond of each other – yet Holmes and Watson are. Sherlock gets this right, and as their friendship grows, it’s very moving and powerful to watch. By making Dr. Watson a woman, Elementary has cut us off at the knees. There are other gender roles you could play with; make Lestrade a woman, or give Sherlock two mommies! Something! Don’t change The Great Original Bromance, arguably the first and finest ever created, the one relationship which lies at the very heart of the whole thing. Moffat & Gatiss (or “MoffGat”, as I like to call them) have loved Sir Arthur Conan Doyle’s stories since childhood. Their genuine joy for the work, therefore, comes through in the final product. (Imagine that!) And everyone involved with the show seems to share that love, and also have a sense of humor about what they’re doing (making telly, not curing cancer!). As a result… Sherlock is funny. Very funny. Elementary …is not funny. I can’t even put my finger on why; it’s just all as serious as an E.R. heart attack. Or, a 24 heart attack. It’s as if Elementary is made by children trying to seem grown up, whereas Sherlock is made by grownups who enjoy life as though they’re still children. Great adaptations take care, they take love, and they take a deep understanding of the source material. And, as in any story (original or adapted), locations matter, but they matter because of how they inform the characters. Relationships matter even more; relationships must be clear and universal, and most of all meaningful to the story. And for the love of all that’s holy, let us laugh! If you can get your audience laughing, they’ll care, and then they’ll follow you to the ends of the earth. Or, if not to the ends of the earth, at least as far as PBS. PS: Fellow writers, it was very enlightening to examine these two shows side by side. Next time you find a show “meh”, wait before you change the channel… see if you can figure out why.